Narelle and Jimi – a couple whose fun-filled wedding, captured by Dan O’Day, first appeared in issue seven of Hello May, are two people we’ll never forget. You see it’s not often you see a bride pull up to her wedding in a four wheel drive. It’s also rare to hear that a venue has pulled the pin only weeks before a couple’s wedding day. 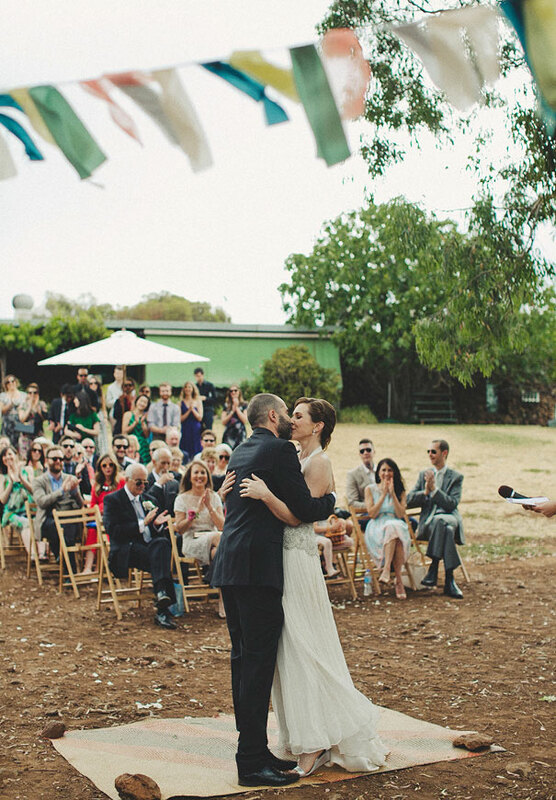 But then a lot about Narelle and Jimi’s wedding wasn’t exactly what you’d expect. 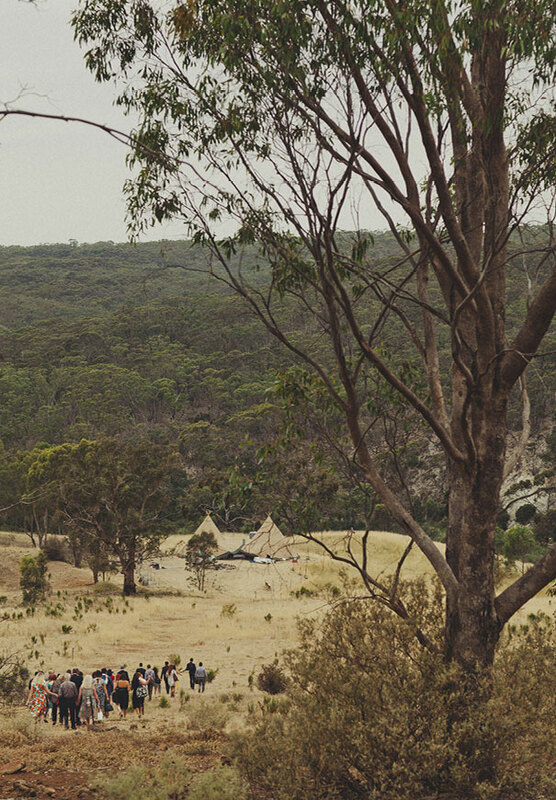 £Having the previous venue cancel added a huge amount of stress leading up to our wedding day, says Narelle who was grateful to have found Sunny Stones, located only 45 minutes from Melbourne, at such short notice. After eight busy years running Wootown Studios together, going bush was a perfect way for Narelle and Jimi to switch off and celebrate. £We wanted a relaxed wedding with lots of fun, food, dancing and laughter, says Narelle who with some hired help from Tipikata, Hudsons Famous, Du Fleur and The Gathering Florist did just that. £My favourite part of the wedding was having the outdoor dance floor… We had around 50 guests stay overnight too so the party kicked on till 6am! It was during those early hours that Narelle’s bridesmaid decided to put on a surprise performance. £My confident but tone deaf bridesmaid sang a great rendition of Cyndi Lauper’s, £Time after time the whole crowd sang along! This opened up the microphone to some impromptu karaoke, says Narelle who has some wise words of wisdom for fellow brides. Can’t quench your insatiable thirst for wedding day inspiration? Why not check out our Pinterest page or one of these recent weddings featured here, here and here. CREDITS Photos Dan O’Day // Bridal gown Bernadette Pimenta Couture // Shoes Mollini // Hair and makeup Eliza Langdon // Earrings Swarvoski // Bridesmaids dresses Donna Morgan // Rings The French Jewelbox // Grooms suit Daniel Hetcher // Flowers Du Fleur and The Gathering Florist // Ceremony and reception Sunny Stones, VIC // Catering Hudsons Famous // Marquee Tipikata // Celebrant Julia’s Celebrancy Services.